Well, I figured I better post up pics and notes on the improved antenna design for my HF bicycle mobile station. I spent some time tuning it up today, and without resorting to the autotuner, I’ve successfully managed to tune up all bands available to me from 40m through to 6m. 80m still remains ellusive however. The new design incorporates a version of the autotransformer used in the earlier attempt, using more turns of wire on the same size former, and multiple output tap points. This allows me to accomodate a very wide turns ratio to match the antenna to various bands. 80m 3.590MHz 1 90 Too high to measure This seems to get the strongest signals. Autotuner is able to tune from here. 40m 7.120MHz 26 48 ~2:1 +/- a turn on the secondary to cover the entire 40m band. 15m 21.200MHz 26 27 ~1.4:1 Slightly out, there is probably a better one. On the top of the autotransformer are for selecting the secondary tap; one of 0 turns, 25 turns, 50 turns or 75 turns (caveat; I might be slightly out with my counts here). Having done this I think in hindsight I’d have been better off moving the 0t one down to maybe 10t instead, as there aren’t too many bands that seem to work on the 0t setting. The primary side is selected by means of a wire soldered on to a thumbtac. 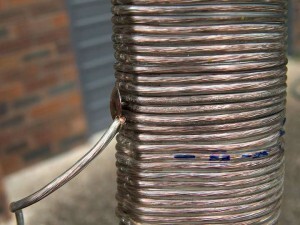 The wire wraps around the tube with a piece of balsa wood for the pin to stick into. You select the turn by piercing the insulation as you push the thumbtac through the wire and into the balsa wood behind. Crude, but it works. In place of the CB whip, I have taken a fibreglass whip and cut it down, stripped the winding, and used it as a support with a base-load spring to take any shock loads. In place of the original antenna winding, is two sections of brass tubing which telescope out. This allows for an antenna that can be partially dismantled and reassembled on the run, unlike the other antenna which was permanently fixed at 6′ length. I have a third solid section I can insert in there too, which would further extend the antenna to 2.5m, but it becomes very top heavy when I do this. The antenna can extend to 1.6m length, or for portable use I can throw a wire up into a tree, or support it using a squid pole and connect that wire to the autotransformer output taps. I didn’t make any contacts while tuning the thing up, although I was hearing New Zealand on 20m quite strongly, and on 10m I could hear the VK8 (Northern Territory) beacon going quite well. I tried a few calls on 28.390MHz, but had no contacts. I’ve also re-inforced the antenna bracket. Prior to doing this the antenna would sway wildly from side to side. Yes, it meant the cars gave me a wide birth (something I greatly appreciate) but I fear had adverse affects on the signal, and probably was asking for trouble in the long run. Putting a brace between the two brackets seems to steady things up just a little bit, and now I can rock the bike side-to-side quite violently without the antenna swinging too far. I’m yet to go mobile with the new improved station. Weather permitting, I shall give it a try Monday evening. I have a meeting with Brisbane area WICEN. Due to headlight QRM I may or may not be active while mobile, we’ll give it a shot, but I should be able to work portable once I get there. 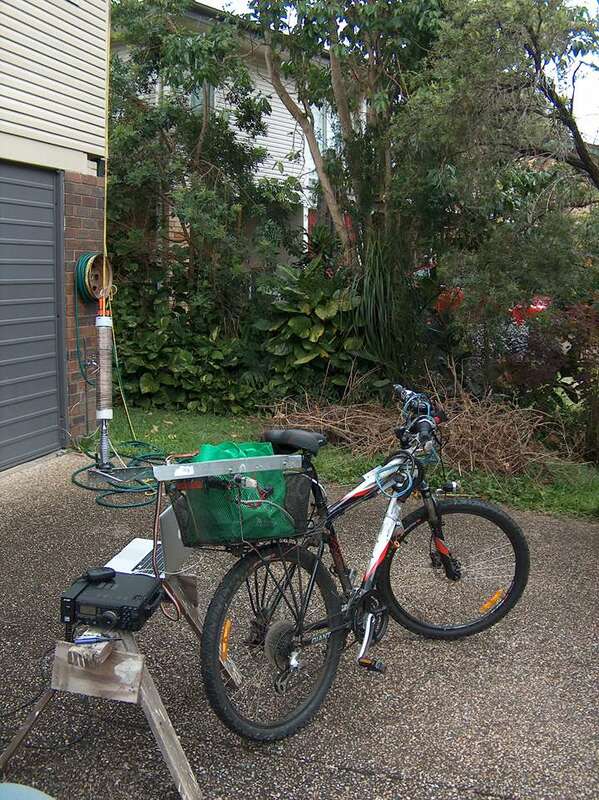 For a little bit I’ve been struggling with poor performance on my bicycle mobile station. It was an intermittent fault. Sometimes it’d work great, other days the FT-290R II would complain bitterly about a SWR issue, and receive performance would be abysmal. But then I’d set off anyway, get a block away, and the problems just disappeared. Or the thing would be working perfect, and I’d get down the road and it’d stop working. Damn frustrating. Intermittent faults such as these are the worst kind to try and locate. I thought of all kinds of possibilities, but the one thing I hadn’t considered was the antenna. Performance had been pretty patchy ever since the weekend before LCA. It was on the Saturday that somewhere between Annerley and Milton, I lost the ¼ wavelength stainless-steel whip that I had been using. So I spent that evening rigging up a SO-239 socket so that I could use the commercial antenna I had; a Nagoya NL-77BH that I bought at BARCfest in 2008. I rigged that up, and on the Monday I did successfully make a contact from the bicycle on my way to LCA, but it was patchy. I did find a few glitches, so fixed those, and Friday I made a contact in the afternoon, but it was still pretty hit-and-miss. Not the consistent behaviour I got out of my ¼ wave at all. Okay, maybe the coax is damaged. Tried different leads, no dice. Recently I bought a front basket for the bicycle, and so I could put the FT-290RII in there. Ran coax back to the antenna, last Wednesday afternoon and Thursday morning it worked beautiful. However Monday it gave me no end of grief. Suspecting that the weight of the radio pressing down on the BNC terminations may have damaged that section of coax, I grabbed a length of RG195 and terminated it with BNC connectors. Still no good. Using the SWR meter in the FT-897D, the impedance match was out by miles. Today I had another look. 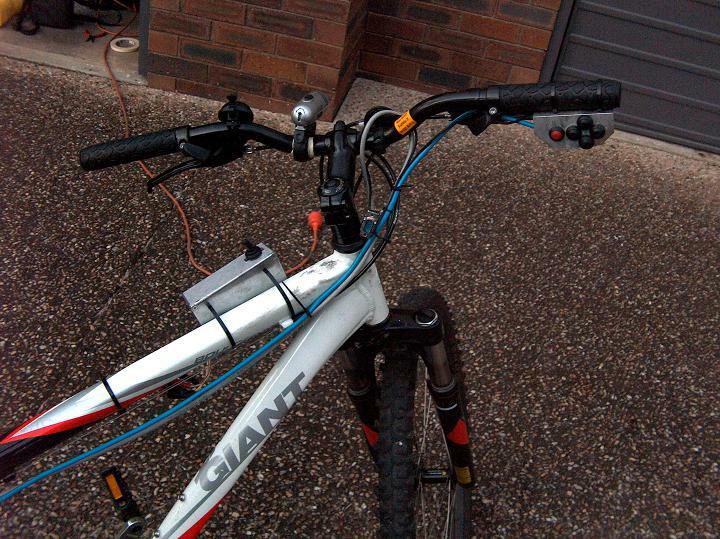 I took the antenna off the bicycle and placed it on a mag-mount antenna base, and placed the base in the centre of an open garage door. So big ground plane, not much different to most cars. Checked SWR, still through the roof. Tuned to the Mt. Cotton repeater on the FT-897D, no signal. Pulled out a hand-held, perfectly clear 5/8 signal on its original rubber-ducky antenna. As I was unplugging the antenna base, I watched the signal strength suddenly shoot up and the radio crackle to life when the shield was disconnected (leaving just the centre pin). 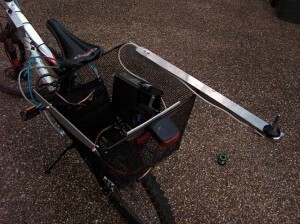 I had noticed a dead short before, but thought it was the antenna mount on the bike… something was up. So, I grabbed a bit of solid copper wire, a PL-259 plug, and some offcut insulation. I made a new ¼ wavelength antenna, cutting it initially at 60cm. Swapped it for the NL-77BH and the performance was beautiful. Check SWR, and yes, it’s high, but then again, 60cm is waay too long. 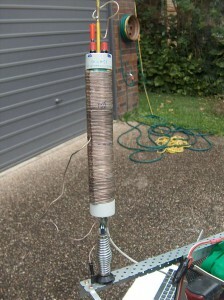 I estimated about 51cm and folded the wire over at that point, twisting the excess around the body of the antenna. Signal strength immediately went up two S points, and on checking SWR, it was significantly reduced. I moved it back to the bicycle where I tweaked it further. Once happy, I cut off the excess, used pliers to fold the end sharply and soldered the folded end to the body of the antenna to prevent it hooking anything. Then used some heat-shrink tubing to finish it off so there were no sharp ends to poke eyes out with. The antenna provides a good match from 144 right through until 148 MHz at 30W using FM. I haven’t tried a contact on the bike yet, nor have I got any pics to share, but the radios seem happy with it, and it appears to be hitting repeaters in the area once again, including Ipswich. Given it’s a good 30km between The Gap and Marburg (as the crow flies) with some decent hills to boot, that’s not bad going. It would appear the additional complexity of these high-gain commercial antennas comes at a significant cost, they don’t like getting shaken to bits on the back of a bicycle. I’m not sure how repairable the commercial antenna I have is, it may be a case of throw the thing out, at which case I think any love affair I had with commercial mobile whips might be over. At least my ¼ wave antennas can be made for <$20 in about 10 minutes from parts I can buy in town, versus spending >$50 and having to wait for it to arrive in the post. I picked up a few new toys recently. I’ve been looking around for a small microcontroller based device to act as a combined remote face / DTMF generator for my FT897D. The idea is that this device could interface with the FT897D via its CAT port, and allow me to adjust the frequency and mode, recalling the information from internal flash or an SD card. 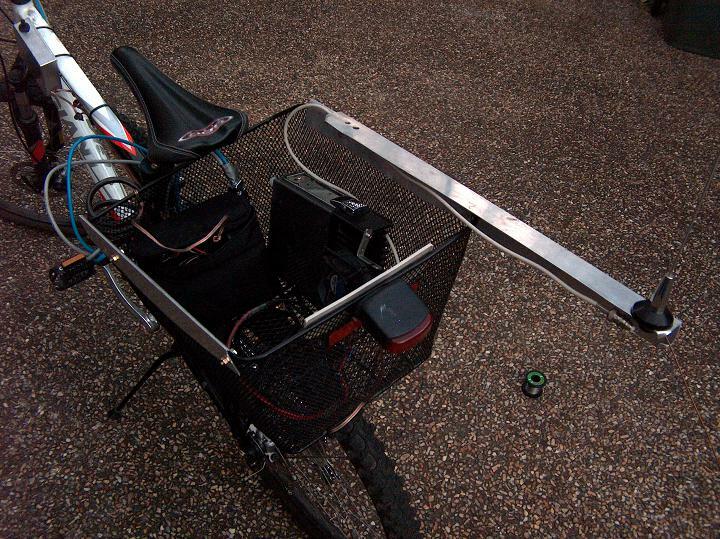 The remote face would then be mounted on the front of the bicycle, and connect to the radio at the rear to allow easy bicycle mobile operation. 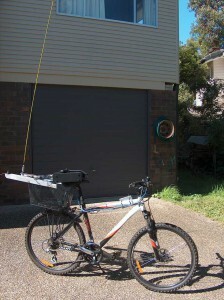 An extension of this would be control of a separate 2m radio, and a GPS to allow APRS from the bicycle. The idea was to have the memory work like a relational database. Rather than just recalling memory channels, and having a big long list, I could scroll through the repeaters by callsign, location (service area), or combined with GPS, proximity. Modern flash technology would make this easily doable. Likewise, for DTMF, rather than having to carry around a cheat sheet or remember IRLP node numbers, wouldn’t it be nice to just be able to scroll through a node list by country/region/callsign, select one, hit the “Call” button, put your callsign across and have it automatically dial the moment you raised the PTT? 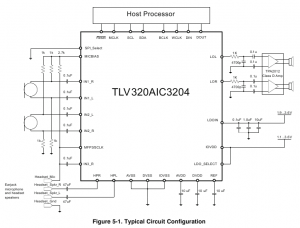 I don’t have the ability to manufacture PCBs of the standard required for ICs such as most 32-bit microcontrollers. SOIC is about as fine as I can muster, and prototyping services are expensive. Thus I was looking for a stamp module or premade board. Luminary Micro (now TI) make a few nice ones, and during my work at Laidley, I got to use the LM3S8962 Ethernet/CAN evaluation board. One nice feature was that it had the JTAG built-in via a FTDI USB-serial chip. However, the licensing for the board support package irks me — despite their code being useless on anything other than one of their chips, they still see it necessary to modify the BSD license adding a clause that prohibits its use on non-TI microcontrollers. I had a crack at writing my own “free-software” Stellaris library, but haven’t gotten that far with it. 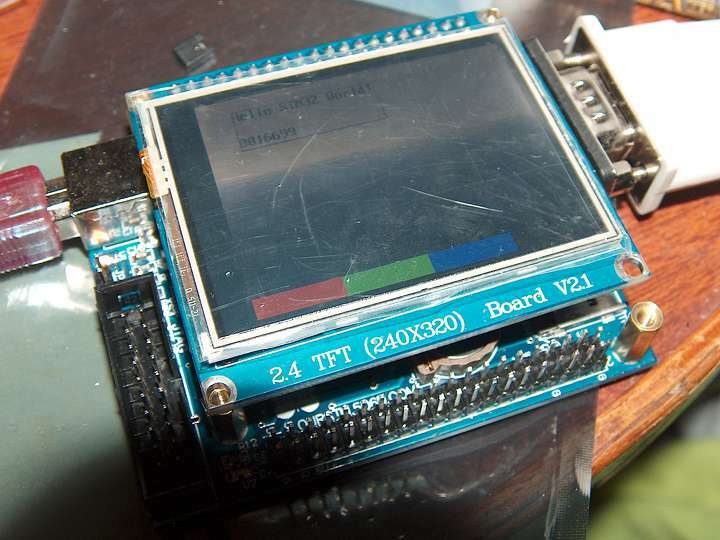 I happened to stumble on this board based around the STM32F103VET. They were being sold on eBay for about $60 at the time, so I decided at that price I’d buy three. ST’s driver library appears to be very liberal in its licensing (in fact they claim there is “no license”, I don’t know if this means “public domain”, or whether I treat it like BSD). The LCD panel uses the Ilitek ILI9320 display controller with internal graphics RAM, and is capable of 18-bit colour. The board also features a RTC backup battery, Texas Instruments TSC2046 touchscreen controller and on-board RS232 level converter. 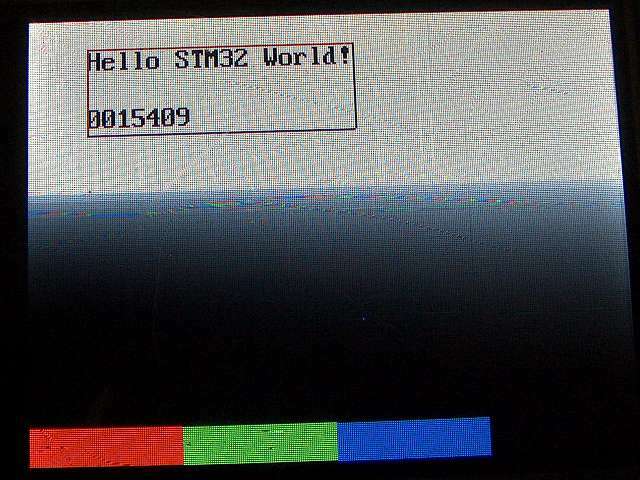 The STM32 also functions as a USB peripheral, and can be programmed using the stm32loader bootloader script via RS232. Interestingly, the LCD controller documentation states that no part of that documentation may be reproduced without written permission. I’m not sure if writing an open-source driver classes as “reproducing” the documentation (as I’d be making documented #define statements in C). The devices come with example source and have a pre-loaded µC-GUI demonstration on them. So far I’ve managed to distill enough out of these sources to get working touchscreen, LCD and UART. I’ll probably start looking at FreeRTOS next and seeing if I can get a workable device going. Well… it seems my tinkering has paid off. This weekend was the weekend of the International Lighthouse Lightship Weekend… and also a federal election. 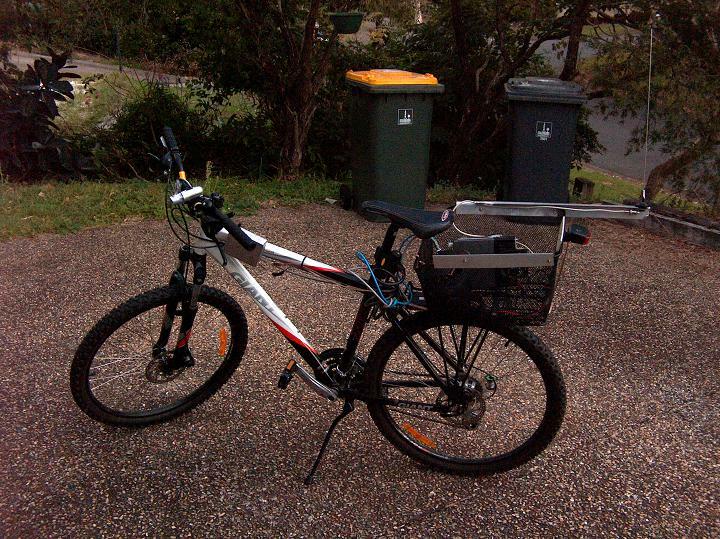 On Tuesday, I bought a trailer for the bicycle … this is primarily so that I can transport groceries, etc… to home since I’ve got the place to myself for a few weeks and need to be independent. Being so low to the ground, the trailer is hard to see, so I made the decision to move the CB whip over to the trailer, not only does it now radiate a signal, but it also alerts drivers to the trailer’s presence. I was up to 3AM figuring out how to mount this antenna on the trailer… but eventually I cobbled together a mounting, moved the homebrew autotransformer over, and hey presto… I had nailed the propagation and visibility problems all at once. SWR is still horrid with the CB whip on the trailer, but the autotransformer brings it down to a manageable <15:1 SWR, which the AT-897 can deal with easily. On the way to the event, I had the station on 14.200MHz… I heard a Chinese station… a BT call, and also later, a New Zealand station. Didn’t make any contacts until I got to the Bulwer Island lighthouse (AU0003) where I made contact with VK5SR, Cape Jaffer Lighthouse (AU0007), registering a weak 53 signal. On the way home this evening, I first started hunting for a 40m tap on the autotransformer… found one that gave me a 10:1 SWR on 7.080MHz… Okay, not great, but better than the >25 I’d get otherwise. I travel to the end of the road, trying to put out a few calls, then when I join the bike path I pause, and have a tune around… a very loud signal on 7.145MHz just about blew me away. I listened for a bit as I cycled… it was Gary ZL3SV, in the South Island of New Zealand. He was in contact with a US station in New Jersey at the time. I could just make out the US station, however Gary just about blew me off the bike… so I waited for a break and called in. 2 others also jumped in… VK4FMVC and VK3BOT. I was barely able to hear VK3BOT, couldn’t hear VK4FMVC (40m can be like that). Gary could hear me though… he was getting me a strong 58 signal. When I checked the S meter briefly, he was registering 59+. This was around 7:00PM (UTC+10). I was doing 100W at the time… running off a 9Ah SLA battery. I suspect I’d be lucky if even half of that was being radiated by the CB whip… Gary mentioned he was using 200W into a 1500′ centre-fed sloper… undoubtedly an excellent system. I’ll have to see about sending a QSL card over to NZ. As I continued home, there was also a VK6 station that joined us on the frequency, however I didn’t get to make a contact there… and I was nearly home. I don’t think I’ll make HF a regular habit on the bike, but I’ll consider doing it again sometime. I’ll also see if I can document the setup a bit more… as it’s showing a good deal of promise. This was one contact I really didn’t think I’d be able to make. 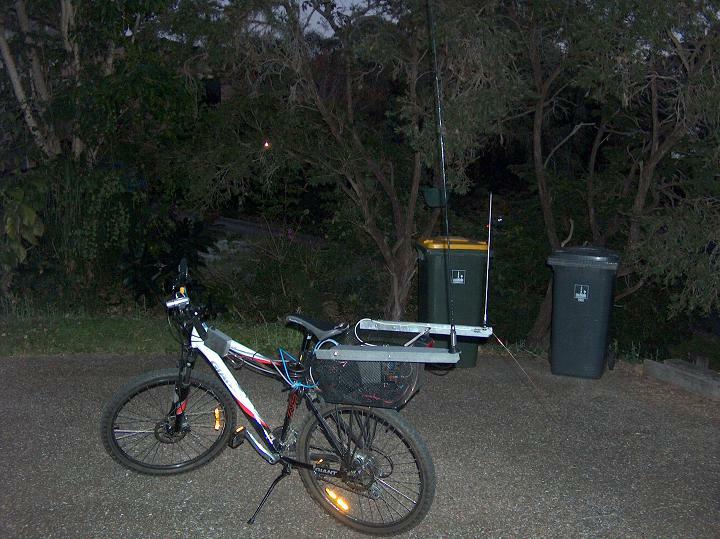 Well… after borrowing an antenna analyser and tweaking a few things… I made my second stationary contact using the bicycle mobile station on 20m. This time, using 20W transmit power. I now know where to place at least one of the taps on this autotransformer for 20m use. 😉 The station borrows heavily on the “Wonder Whip” style concept, where an autotransformer provides a means of matching the wild variances in impedance of the antenna, to something reasonable for the radio to cope with. Shown here, is the station, exactly as it was during this contact. The fibreglass 6′ CB whip has been spray painted yellow to make it more obvious, I plan to put a flag on there so that it resembles a bicycle safety flag (a big one) so it arouses less suspicion. Click on any of the photos for a closer view. This weekend was the day of the Remembrance Day contest, which is one of the major contests ran by the WIA. Tuning around on 20m, I heard Kirby VK7KC booming in a S8 from the apple isle. At first I tried contact with 5W, no dice… then 10W, then 20W… no luck. I tuned off, and tried a different tap on the autotransformer… bingo, that sounded a bit noisier… I hit the button on the autotuner to clean up any last issues with the SWR, then tuned back and had another go. Eventually after some perseverance, contact was made. Below is a shot of the FT897D showing the frequency and S-meter reading shortly after the contact was made…. I was weak into Tassie, but that didn’t matter to me… as far as I was concerned, if I got outside metropolitan Brisbane, I was happy. I haven’t yet tried other bands, although I’ve figured out some tap points for 6m, 10m and 15m… and some possible maybe points for 40m although I think the antenna will be very deaf down there. The transformer still uses a map pin pushed though to select the tap… I’m not sure how well this will go long-term, and I think moving towards using banana plugs (or at the very least, alligator clips) will be a better solution. Switches are another possibility. Something that will be a more reliable connection than a pin pushed through a wire. Shown here, is a close-up of the rear basket, the autotransformer is shown underneath the antenna bracket… which helps provide a bit of capacitance. I find having it close up against the bracket helps, although I made provisions to be able to hang it vertically too (thereby reducing the coupling). For now I’ll probably solder the centre conductor of the coax in place of the map pin, so that it’ll stay put until I can find a more convenient solution. At least I have something on HF that works to a moderate degree. I’ll probably give it a try next weekend on my way to the Queensland Maritime Museum, where I’ll be operating the Bulwer Island lighthouse as VK4MM in the International Lighthouse Lightship Weekend. Hopefully I can stir up 20m sufficiently so that there’ll be some activity when 00:00 UTC rolls around. Well, I did some experiments this weekend regarding the bicycle mobile station using an autotransformer to match the shortened end-fed whip (6′ 27MHz helically-wound) to the 50ohm impedance my set demands. 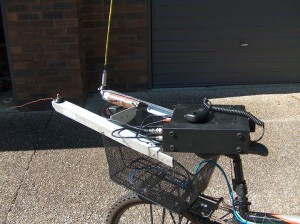 I haven’t tried this on the bike itself… these were done in my bedro^W(ahhem) “radio shack”… with the antenna and its bracket sitting on a wooden chair connected to a longer bit of coax than I’ll probably use on the bike. I will have to try this on the bicycle (ideally with an antenna analyser) to get a better idea of performance, and the up-coming Remembrance Day contest may provide a good opportunity to gauge performance, as the bands will be sufficiently “busy”. Early testing seems to indicate the ability to obtain good SWR figures on 6m, 10m, 20m and 40m. 80m (the holy grail for me) eludes me… and I suspect the actual radiated signal will be very low down to most stations… but if I can cover parts of metropolitan Brisbane with it, I guess I’m doing okay. The fact that this antenna got down to VK5 with 100W up it, is a promising sign… perhaps with the autotransformer, it may do better. Then again, it may do a lot worse… We’ll see. Plan is to try and get it up and running before the ILLW… so that I can stir up some activity on the bands on my way to the Bulwer Island lighthouse (AU0003) before becoming VK4MM and operating a station there. Well, I’ve been riding a lot between West End and The Gap, and I get a lot of questions from people on the band about my setup. I was doing some repairs… one of the wires to the PTT had disconnected, luckily there was a 0V return via other connections… and so while I had the bike outside fixing that (it was too dark in the garage) I took the opportunity to snap some photos. The light was fading at the time, so the pictures aren’t particularly great… I’ve touched them up to make them brighter, hence there’s a bit of noise in the photo… The last two showing the HF setup, required a flash (which I was trying to avoid due to the aluminum and reflectors)… and of course I didn’t spend time putting the FT-897D in the back… maybe later when I get everything tuned up and actually do make a true bicycle-mobile contact on HF (this one was not made mobile). Above, is the station in its entirety… fairly simple. The antenna is a plain 2m ground-plane, formed using a tunable mobile whip cut for 145.700MHz, the aluminum angle bracket makes up one counterpoise, and an additional counterpoise hangs out the back. Adjusting the angle has an influence on the SWR… in this arrangement, it works nicely. Shown here is the rear basket where the FT-290R II (or FT-897D for HF) lurks… along with a 9Ah gel cell battery, which also powers the tail light. I haven’t been very neat about the cables. Two leads run from the front controls, the grey one (shielded) carries transmit/receive audio and the PTT, the blue one (Cat5e UTP) carries the four directional buttons — with spare wires connected to 0V. A DB15HD (“VGA”) connector terminates the cable at each end. Remember how I mentioned the hand-mic in the last station was going to be temporary? Well… this is the arrangement here. Shown here is the PTT switch (red) and four directional buttons. Not all radios make use of all buttons … the FT-290R II uses only the up/down buttons, the FT-897D uses the right-hand button in addition for the “fast” button. Homebrew microcontroller-based radios I build will probably use all five shown for a menu interface. There’s no display in front of me, so don’t ask for an accurate signal report, I can tell you whether it’s a Q3 or a Q5, but any S-meter reading will be a wild guess. Future expansion of this may include a small potentiometer for a local volume control, and a small microcontroller-driven LCD that could be used to interface to the FT-897D’s CAT interface… but this is just early days. The flash was needed here, took me a while to figure out where I had put the bracket (I don’t plan to ride with the HF antenna or bracket mounted very often). This is fortuitous in a way since you can now more visibly see the 2m antenna. The CB antenna mounts on a nearly identical bracket. I don’t bother with the radial out the back, as there’s no way I’ll make one long enough that would be practical. The antenna will need some work, in particular, either addition of a base-load coil, or modification, to make it resonant on the amateur bands. With a small base-load coil, I should be able to make it a half-wave end-fed on 6m… some more and I should be able to make an end-fed quarter-wave on 10m. This will be the subject of future experiments. This tuning section will probably mount on top of the mounting itself, underneath the spring shown on the right. Well there it is… this is the contact made using the bicycle mobile station… with little more than a mobile CB whip. That arrived in the mail this evening. Time for me to investigate ways of tuning this antenna properly though, rather than making the auto-tuner do all the hard work. Well, I can’t call it a “bicycle mobile” contact per se… it was made using the bicycle mobile station however. This afternoon about 1:50PM UTC+10 I made contact with VK100WIA being operated by the South Coast Amateur Radio Club at a frequency of 14.188MHz USB. 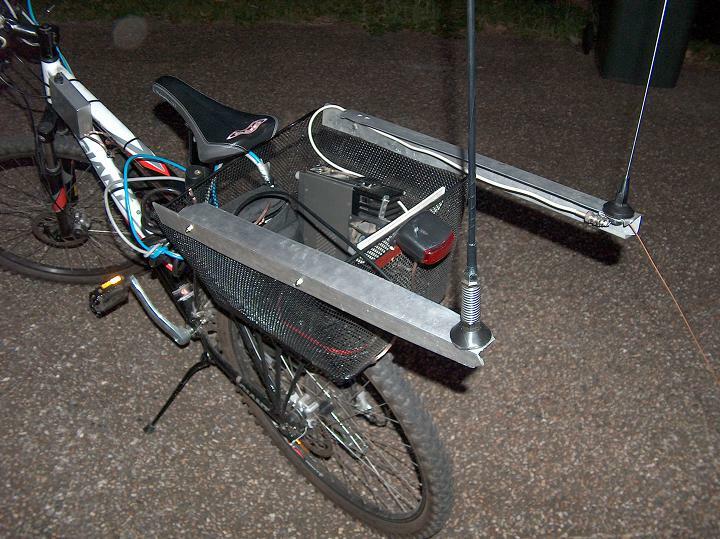 The station was being powered by mains, and transmitting 100W (most of it probably rattling the tuner) on a 6′ long CB whip mounted on the back of the bicycle mobile station. The SWR without the tuner was very high, so I’m going to have to look at tuning this in a lot better than it currently is. I registered a S5 Q4 signal with the other station, who was a perfectly clear S8 Q5 copy at my end. I was also hearing New Zealand elsewhere on the band… very stong signal. I will need to tune the antenna up quite a bit for it to work on 20m… I’m surprised it even worked at all! I tried a few other bands… 10m was dead quiet, couldn’t get any of the FM repeaters, no activity. 6m, I could trigger VK4RBX at Ipswich, but no one about it seems. This is from my driveway at my home QTH … not in a high location. So a bit of peddling up the hill and I might get quite a distance with my rather limited antennas… but I’m going to see if I can tune the thing in a bit better. My observation of others’ is that one does better when the tuner is an integral part of the antenna, and this is what I’m going to have to do. If the tuner is going to have to do hard work, then let’s get it out into the open and helping the cause. In the meantime, I’ll have to print a couple of QSL cards… I still need to send one to Mario OS8M from the Christmas evening contact I made on 20m… but it’s only just now that we’ve got a working printer again. 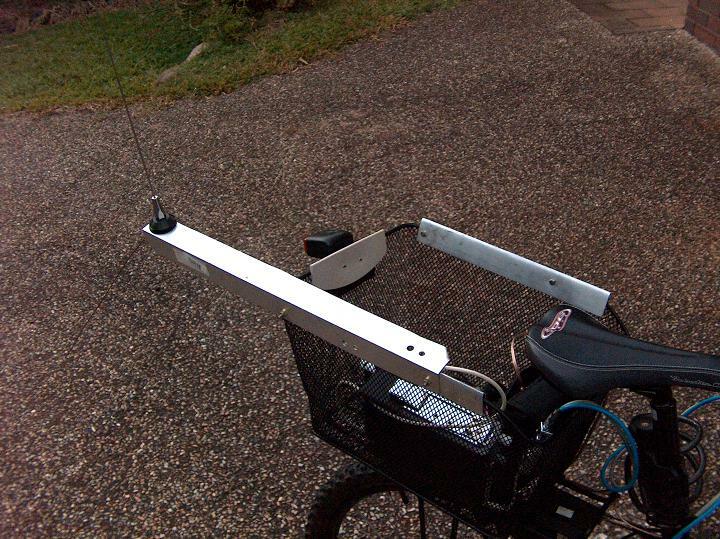 Well… just this afternoon, I made some steps towards getting HF going on the bicycle mobile station. Usually, it’s VK4RBS in the centre of town unless there’s activity on VK4RAX. VK4RAX as I get closer to home. I’d listen to the latter all the way, but pagers clobber the receiver on the poor FT-290R II. Hearing pagers is bad enough … try it through a headset! Made worse by the fact that the headset is a semi-homebrew design, embedded inside a motorcycle helmet… so I can’t easily take it off. Once I’m out of the city however, the pagers aren’t an issue. Range is pretty good… I use a quarter-wave ground-plane antenna on 2m… actually, the antenna itself is the same as on my previous bicycle-mobile station… a tunable whip antenna. The antenna is intended for mobile use on a car, so to give it a reasonable counterpoise, I cut a 500mm long piece of aluminium angle, and bolted the antenna mount to that. I found that alone, wasn’t good enough, and since added a 500mm long piece of copper wire that hangs out the back. That brings the SWR down nicely into the range where the FT-290R II is happy to work with it. I have been able to open the squelch of the Toowoomba (VK4RDD) repeater, once waiting at lights at West Ashgrove, and another time, underneath the Goodwill Bridge at the Queensland Maritime Museum near South Bank in Brisbane. I also can work the Ipswich repeater, VK4RAI while walking up the hill along Cooper’s Camp Road at Bardon… about a distance of 80km out to the repeater’s location (near Marburg). This is using the FT-290RII with the 25W linear option, and the aforementioned antenna. This afternoon, I figured out how to interface the electret microphone in the headset to the FT-897D. The wiring standard I use for my headsets is a customised one… using DB15HD connectors (VGA-like). A female DB15HD exists on the headset side, this is to prevent some goose trying to plug a headset into a VGA card on a computer. The following is a rough schematic of a typical headset using this wiring scheme. Typical headset wiring schematic... looking into female DB15HD connector. There are three pins that are normally unused… On a couple of my interfaces, +5V and 0V are wired up… it was initally thought I’d use these for power rails … one supplied by the headset (one of my planned “headsets” was a former in-car hands-free kit for a Nokia 3310, and so you’d be able to charge the phone this way), the other supplied by the device (many radios supply a 3.3V or 5V rail). For the FT-897D, the microphone used is normally the dynamic type… that is, uses a balanced (differential) audio feed. On the FT-290R II, I tie Mic – to 0V, and just use it single-ended, which works fine… but a better way is to actually convert the single-ended microphone signal to differential. How does one do this? 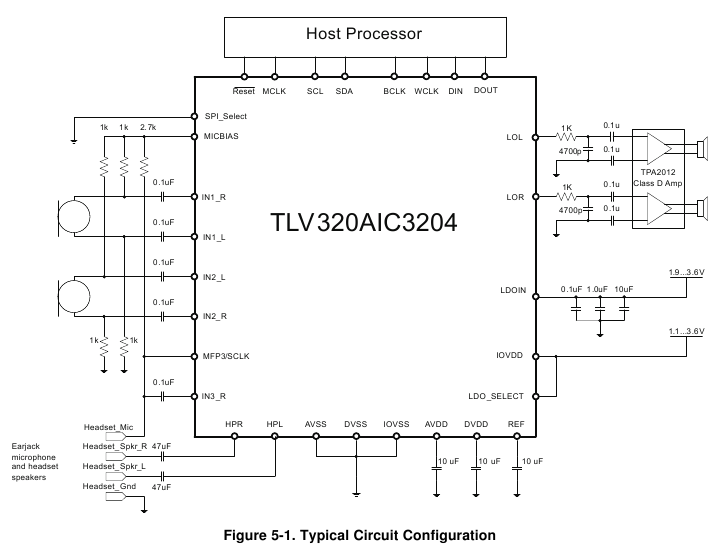 Well, the answer came out of the TI TLV320AIC3204 datasheet which I’ve been reading quite a bit lately. I noticed something odd about the way they wired up an electret microphone. Rather than wiring it up as shown on the left… they instead mirror the positive side; feeding through a resistor to 0V, but tapping off via a series capacitor to the CODEC input (see right; click image to enlarge). Why were they doing this I wondered? Then I found it. Inside the electret capsule is a J-FET which amplifies the weak signal from the microphone itself. By hooking a resistor on both sides, and using two capacitors, they were creating a phase splitter. I stumbled across that article on Wikipedia, and it was then I knew what they were doing. I’m yet to take the whole shebang for a ride… I have a 6′ long CB (27MHz) whip that, last time I tried, tuned up nicely on 10m and 6m… might work somewhat down on 20m. I have had a VK2 station come roaring in at S7 when listening on 80m via this antenna on the back of my fold-up bicycle, but unsurprisingly it’s pretty deaf there… I plan to get a second antenna mount and suitable spring (so the antenna doesn’t get snapped by a low branch), make up a new bracket, and mount that some time in the coming weeks… then we shall see what the bands are like around Brisbane.